Dr. Bill Scharf, a gull, tern, and colonial waterbird biologist, has dedicated much of his career to studying Herring Gulls on the Conservancy’s seven-acre Gull Island Bird Sanctuary, also known as Bellows Island, in Grand Traverse Bay. With over 30 years of research here, he has examined trends, noted abnormalities and has used this information to help the Conservancy write a management plan for Gull Island. This vast knowledge and dedication to birds has made Dr. Scharf an extremely valuable volunteer on many sails aboard the Inland Seas’ outings to Gull Island as well as a leading source of information for any matters regarding gulls. Most commonly, people ask the Conservancy why we want to protect an island of gulls, a seemingly abundant, annoying, creature, but there is much more to this story. Jenee Rowe, Stewardship Director, and Juliana Lisuk, Outreach Intern, sat down with Dr.Scharf in late June to discuss the importance of protecting Gull Island and the research performed on the island. Why should we protect Gull Island as a bird sanctuary? What would happen if we didn’t protect it? Gull Island is home to thousands of Herring Gulls who choose to nest here from April-June. Numbers of these birds have been decreasing in Lake Michigan and Huron, mostly hit by changes in predator fish planting. The gulls compete with these fish for “forage fish” such as alewife, smelt, perch, and round gobies. Although the numbers have not alarmingly dropped yet, the Conservancy’s protection of Gull Island will forever ensure a safe haven for future nesting. If we didn’t protect it other detrimental development plans would most likely occur, preventing wildlife from being able to utilize this critical habitat. Also, protecting Gull Island is not solely for the Herring Gulls, but it is a valuable step in looking at the part it will play in protecting the greater ecosystem. Why do birds nest on an island? Gulls choose to nest on island-like sites. This could mean an actual island such as Gull Island, or other similarly isolated areas protected from predators such as fenced-in industrial plants, but for the most part there is no nesting on the mainland. There are no mammals on the island whatsoever, including humans, creating an ideal place for the birds to nest. Isolation is key to the choice of nesting sites for the birds. How do pairs choose their individual nest site? Gulls choose their site through displays called “chokes”. Each bird will select a site and press their cheek against the ground. When a common nest site is selected the two birds will choke in tandem. Having area protected from disturbance is very important to this nesting ritual. What research projects are going on? Egg sampling is one of the primary research projects on Gull Island. The first egg sampling occurred in 1962 by James P.Ludwig. From observing the thinning of the shells and measuring levels of DDT, PCBs and other toxic substances in the yolk, researchers can gauge the health of the surrounding aquatic ecosystem. This research lies under the title of ecotoxicology, which is the study of the effects of toxic chemicals on surrounding biology. Herring gulls are some of the top predators in the aquatic ecosystem eating fish that accumulate toxins in their fatty cells. Gull Island was very important in the DDT era due to evidence in the numbers of nests with two females, surplus in female birds and other abnormalities that were studied. DDT was high in the ‘60s and 70s from pollutants from the land washing into the lake, but has declined significantly now. Continuance of yolk sample testing and bird counting is “completely my thing.” Counting the island population once a year since 1968, I see the value in recording steady data for many years to analyze patterns and publish the research for the use of others. Dr.Bill Bowerman heads up toxicology testing and I have assisted Bowerman since 2006. What effects have humans had on the birds? Disturbance is a huge factor in survival of the birds. Chicks can be eaten by neighboring adult birds and other predators if they leave their parent’s territory. Besides disturbance, the number of Ring-billed Gulls has been steadily increasing in Lake Michigan, and in turn their number of nests of Gull Island, due to an increase in waste produced by humans. Their competition has a negative impact on the Herring Gulls. Ring-billed Gulls are generalists when it comes to their food choice and will eat almost anything whereas Herring Gulls feast primarily on aquatic creatures such as alewives and smelt. Ring-billed Gulls appeared on Gull Island in 1997. They are 1/3 smaller than Herring Gulls and have a smaller territory, but are much more active and pesky. Ring-billed Gulls are those you see most commonly on the beach and in the dumpsters. What made Dr.Scharf interested in bird protection and research? “Why not?” was Dr.Scharf’s immediate response. 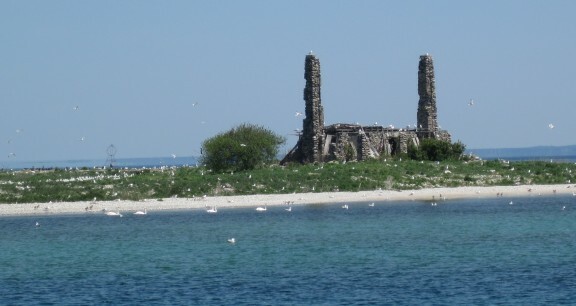 He then went further to explain that it stems mostly from his stewardship ethic as well as that of a great many people both in and outside of scientific curiosity, but he also believes keeping an inventory of a natural phenomenon such as nesting on Gull Island provides an indicator of environmental standing with valuable information about the status of toxins and natural populations. What resources would help people understand Herring Gulls better?